Last week I installed the first exhibits in the lower level of Cushwa Hall near the auditoriums. This is a busy hallway and I noticed many students looking at the displays as soon as I finished them. I am very excited to have these spaces to feature cool stuff from the museum’s collection. In the future, student research on the museum’s collection or topics of medical history could be displayed here as well. 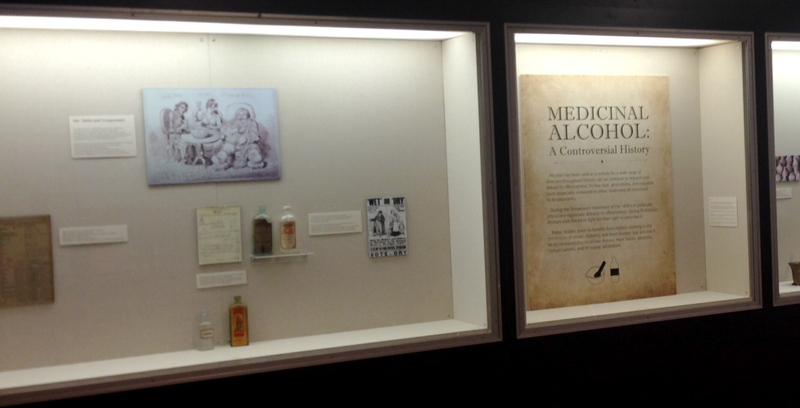 The first display is about the history of medicinal alcohol. American physicians believed that alcohol served a variety of therapeutic purposes and prescribed it regularly through the 1800s. It was fascinating to read about their uses for wine, gin, whiskey, and beer. In the early 1800s, some doctors started to question this practice as they realized that too much alcohol or addiction to alcohol could be bad for your health. The exhibit particularly examines the use of alcohol in the early 1800s and how it united doctors against the government during Prohibition. The museum has several artifacts from the Prohibition period which were donated by the family of a Cleveland doctor. For more information about doctors’ use of medicinal alcohol during Prohibition, see this post. 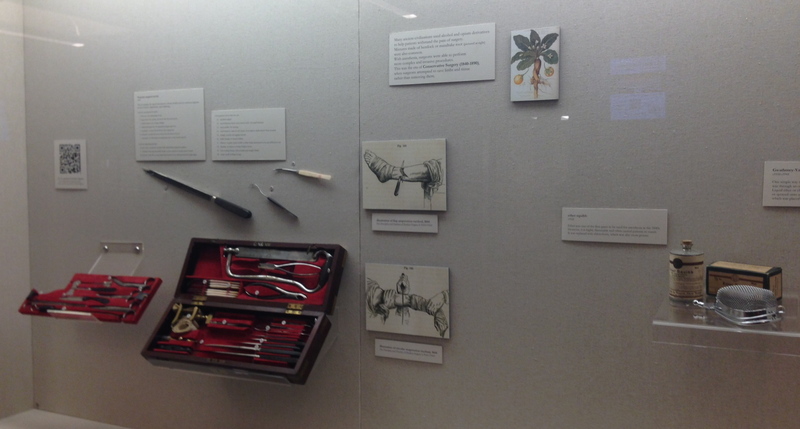 The second display features two surgical kits that were recently donated to the museum by Dr. Rashid Abdu. The display chronicles the advancement of surgery. It begins with illustrations of tools used in the 17th century and a trephine kit from the 1780s. The second large case features a three-tiered surgical kit from the 1850s (pictured above) and some early anesthesia equipment. The last case discusses the rise of antiseptic practices, in particular masks, gloves, and metal tools.